I’m just back from a four day landscape photography workshop on the Isle of Skye with the GFX50S as my travelling companion. Here’s my thoughts on landscape photography with the GFX50S performed. This has never really bothered me until I started with photography. Living in London there is not much need of a car, but it means it is tricky to get to locations without public transport. Attending a workshop seemed liked the easiest short term solution to my accessibility problems. It was nice having not to worry about where we would go, and when, depending on the weather. I did not really appreciate the effort that went into location scouting before this workshop. Funnily enough, even with the logistics taken care of there was still plenty to worry the landscape beginners. During the first sunset we were all panicking as the light disappeared and running in to each other’s shots. We were a little bit unlucky with the weather and only really had one decent sunrise and sunset. One full day was completely lost to rain and it then rained on and off during our remaining time on the Isle of Skye. Luckily, the GFX50S is weather sealed, but keeping the water off your filters and lens was a hassle. I absolutely loved landscape photography. Isle of Skye was simply incredibly beautiful in a sort of barren minimalistic sense. We did not see many trees but the vast, grass/moss covered landscape just seemed to go on forever. When it did stop, there was usually a massive mountain in the way. Plenty of sheep dotted the landscape as well. We could have stopped the car every 20 seconds to go out and photograph something. I brought the GFX50S, obviously, with both my lenses: the 32-64mm and the 120mm. 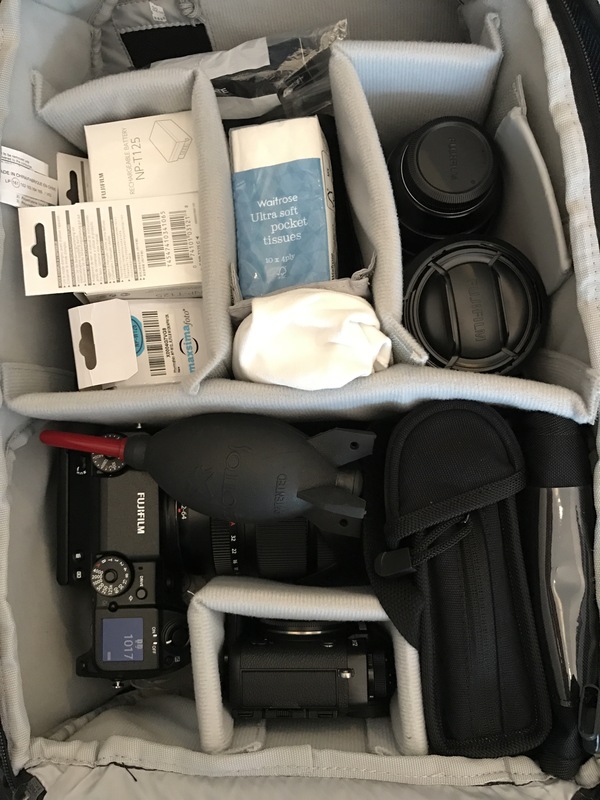 Also in the kit was my complete set of Lee Filters, the X-T2 with the 10-24mm, spare batteries, lens wipes and my RRS TVC34L tripod with the new Arca Swiss P0 Hybrid head. I quickly came to appreciate my rain and wind proof jacket and hiking boots. It didn’t take long before I went and bought myself some rain proof trousers as well. First lesson of landscape photography is to make sure you remain warm and dry whilst waiting for that perfect sunrise or sunset. The GFX50S spent the fours days either in my backpack or on the tripod. I pretty much only use my cameras in manual mode lately, and when my camera is on a tripod I tend to use manual focus as well. Turns out landscapes don’t move around that much, which makes life easier, but you can’t really ask it to drop a shoulder slightly or turn into the light. The focus peaking in combination with the excellent screen made focusing easy. When in doubt I double clicked the rear command dial for a magnified view. To make life even easier I set dialled the peaking to its highest setting and changed the colour of it. I never attached the EVF as when I use it with the tilt it doesn’t easily go into my backpack, but I don’t feel I need it when I’m using the camera on a tripod. The GFX50S is the first camera I own which has highlight warnings. I experimented with the setting but decided to leave it off for most of the time and just rely on the histogram. You can see the histogram wither by swiping up on the screen or press the Display button a couple of times in playback mode. Histogram are a lifesaver as there is nothing worse than blown highlights. There is also a 3D level which you can show in the live view the same way as the histogram and highlight warnings. Keep the horizon straight people! I mostly used the GF32-64mm which performed admirably and any softness in the images is either my own fault or due to the rather windy conditions. Most of my exposures were at least 60 seconds and I did not have anything to weigh down the tripod with. Our last sunset shoot, not that there was any sun, I spent huddled over the camera and tripod to try and shield it from the wind. My Gore-Tex jacket was my favourite possession that evening. The one thing I was less than pleased with is when you are in T-mode and change the shutter speed. Normally it adjusts the shutter speed in 1/3 of a stop, but after 60 seconds it goes in full stops. I really hope there is a setting to change this or a future firmware fix. I’m very happy with the GFX50S in general and certainly have no complaints about image quality. The only thing holding my images back at the moment is my own skill. In my mind there is no doubt the Fuji GFX50S is an excellent choice for landscape photography. It’s rugged enough to deal with the worst weather of weather. In fact, I found it a lot tougher than me. The GFX50S also has the right feature set for landscape photography and few cameras offers much an improvement. You probably need a XF from Phase One with focus stacking and a seismic meter to beat the GFX50S. 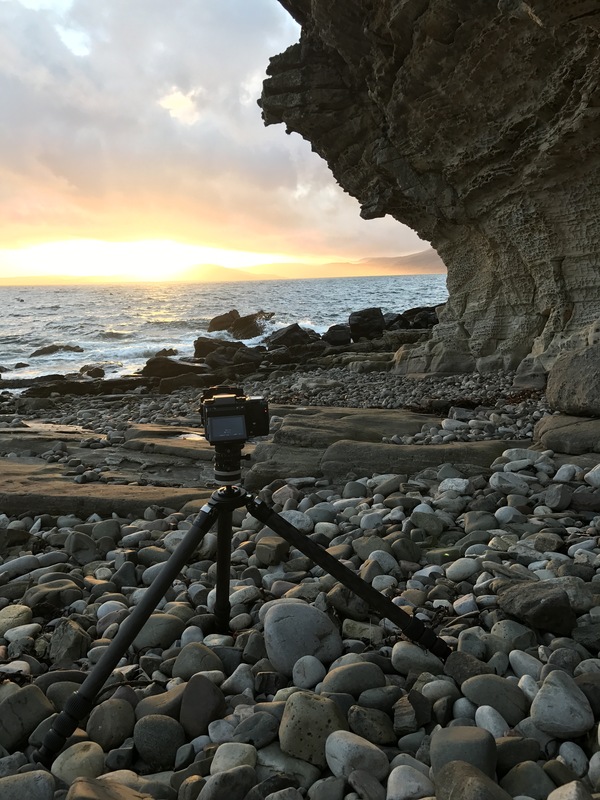 Great write up Erik, I am glad you enjoyed the Isle of Skye and landscape photography, and congrats for your new camera, looking great!